I just had cauliflower for dinner. And it tasted really good. It actually overshadowed the rainbow trout. Which, while unfair to the poor fish, was rather exciting for the rest of us. Although really, it just goes to show that the old maxim “put cheese on it” remains excellent advice. For people who like the pictures of food but don’t like strange grains, this one is for you. Preheat oven to 230C (425F). Bake, stirring once at 10 minutes, until slightly browned on top/edges (20 minutes). Remove from oven and turn once more, pushing the pieces in slightly so you can’t see the bottom of the pan between them. This will prevent most of the parmesan from burning onto the pan. Sprinkle with fresh-grated parmesan and bake another 10 minutes. Dice avocado into small bite-sized chunks. Slice kale into bite-sized pieces, removing large ribs as desired. 5 minutes before the parmesan-baking is done, heat frying pan to medium. Fry kale in olive oil until slightly wilted but not crispy stirring often. Season with salt, pepper and a hint of chili powder. 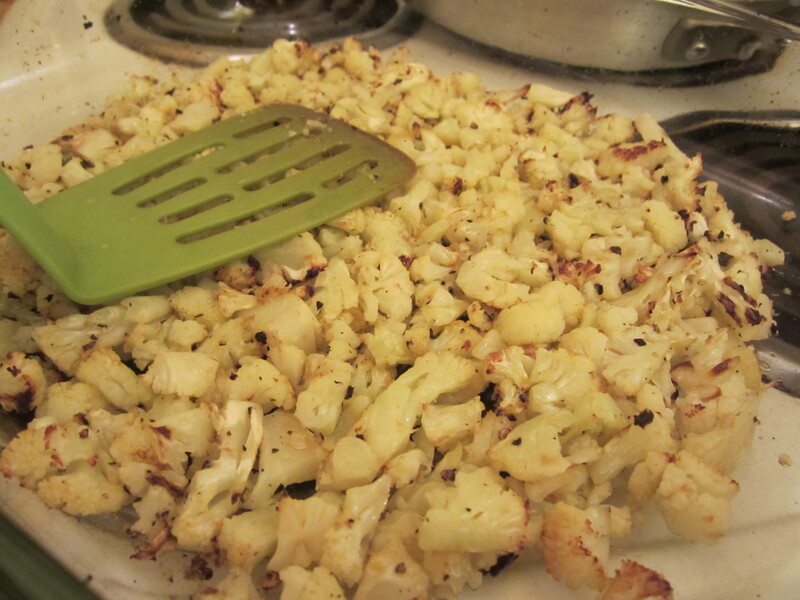 Remove cauliflower from oven. Toss cauliflower, kale and avocado with lemon juice and yoghurt, adding more spices as desired. Patting the cauliflower into place to receive the parmesan. Note the browned edges. *If you lack any of these spices, substitute in something similar. The thyme, for example, was supposed to be rosemary, but I grabbed the wrong jar and then really liked the substitution. The inspiration for roasting the cauliflower with parmesan came from this recipe. The rest came from a strong desire not to let a good avocado go to waste. Or the cauliflower. Or the farmers market kale. The cauliflower had been waiting for some love for quite a while. I think we can agree that the wait was worth it. Remember those kale stems we removed early on? Those haven’t gone to waste. But more on that tomorrow. Hello, my dears. Are you feeling fearfully neglected? Well, you have been. My leisure of late has been spent largely in my kitchen. I spent much of Sunday poring over a newly discovered food blog, Cookie & Kate. Isn’t that the best name? Cookie is a dog. (Kate is a person.) 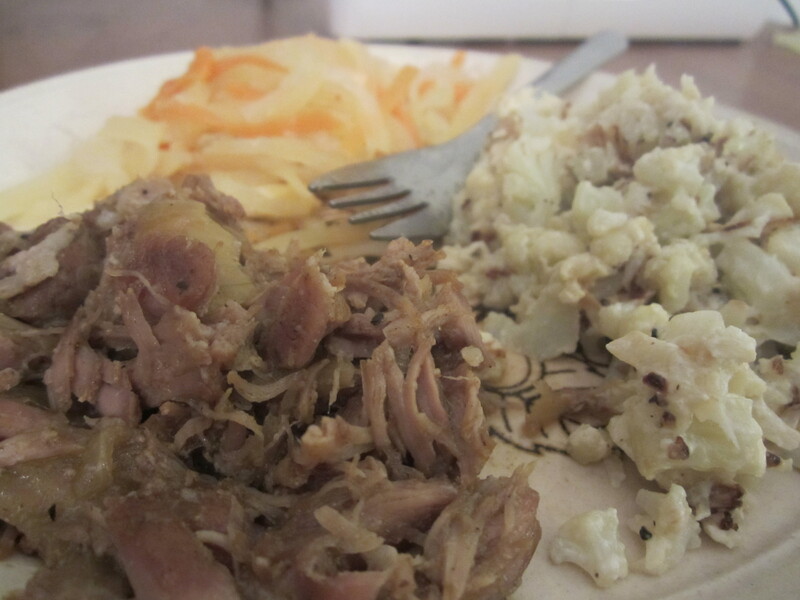 It’s a vegetarian blog, which means new and interesting dishes. Since meat isn’t expected to be the star, a lot of effort goes into making veggie dishes really interesting and appetizing. Even if I sometimes serve them with a side of steak. 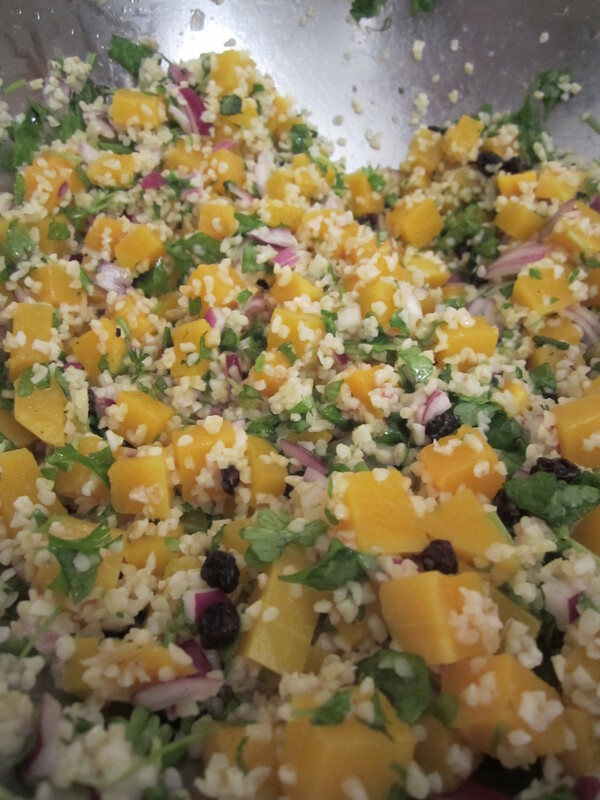 Sunday’s dinner: butternut squash tabbouleh with a side of steak. So good. The only change I made was to use currants instead of cranberries, since I had them on hand, and add a bit of coriander and pepper. But not too much. The point of tabbouleh is to let the fresh herbs speak for themselves. Popping amaranth is fun. Once you get the hang of it. You have to heat up the pan really hot–always hotter than you think you need–then put in a spoonful of grains. If they start popping immediately, you’re good to go: put the lid on, and in ten seconds they’re fluffy and done. Pour them into your “keep” bowl, heat the pan a little and make another spoonful. If they don’t start popping immediately, the pan isn’t hot enough, and that batch is never going to pop right; pour the scorched grains into a bowl to throw away later, heat the pan hotter and try again. Learn from my experience and don’t dump the ruined grains in the bin until they’ve cooled, unless you have a metal or glass bin. You’ll melt the plastic. Having popped the amaranth, I turned my mind to the dates. It turns out that tiny food processor really can’t handle dates. They just kept whirring around and around in the bowl. Wop, wop. Amaranth date bars were a no-go. 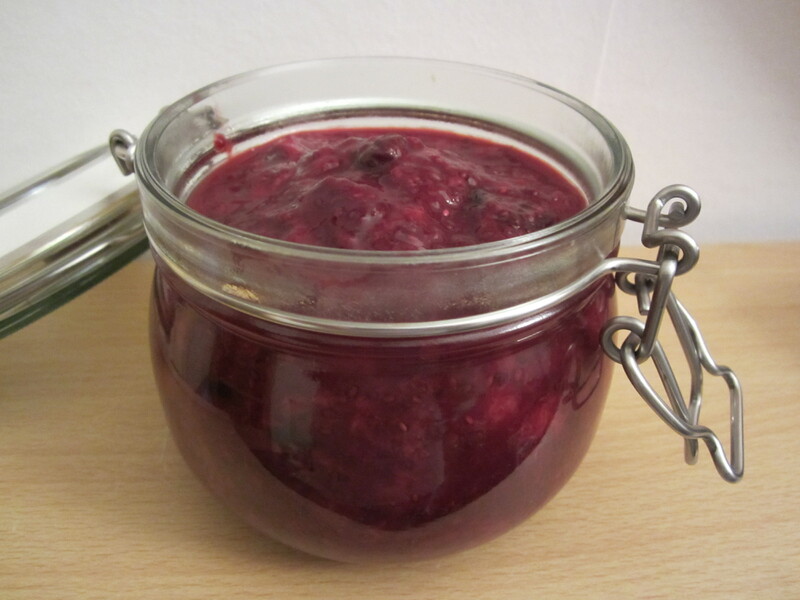 To keep the granola company, I made chia berry jam from frozen berries, with a frozen banana for sweetness. It simmers for half an hour on the stovetop, so I kept an eye on it while I made dinner. 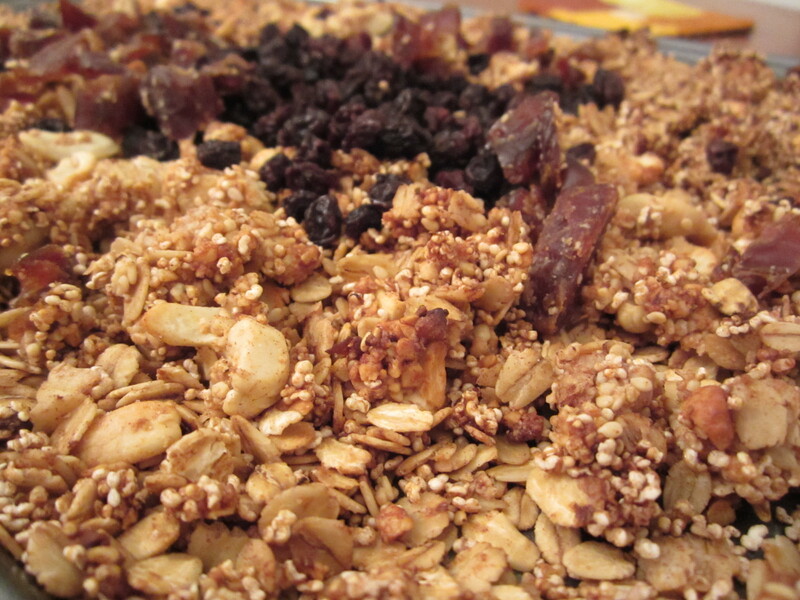 Smelling the granola in the over while I stirred jam on the stove gave me the strangest sense of cognitive dissonance. 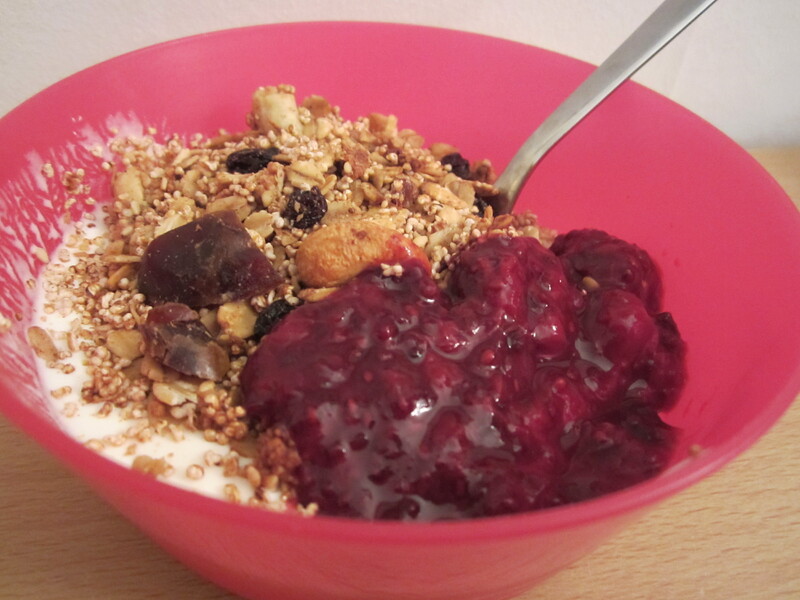 I enjoyed the granola and jam with greek yoghurt for breakfast all week. The turbulent and truncated affair of the amaranth date bars turned out deliciously in the end. As promised, the recipe I use for DIY chai concentrate. This is an amalgam of recipes found in various places on the internet, plus things I had in my kitchen and minus ingredients I don’t go for (fake sugar, anyone?). The result has no calories and no dairy (or dairy substitutes) and can be mixed up with a number of different bases. Notably, as lattes. Bring water to a boil. Add spices, simmer covered 15 minutes. Add tea bags or tea (in strainer), let sit 5 minutes. Remove tea and star anise. 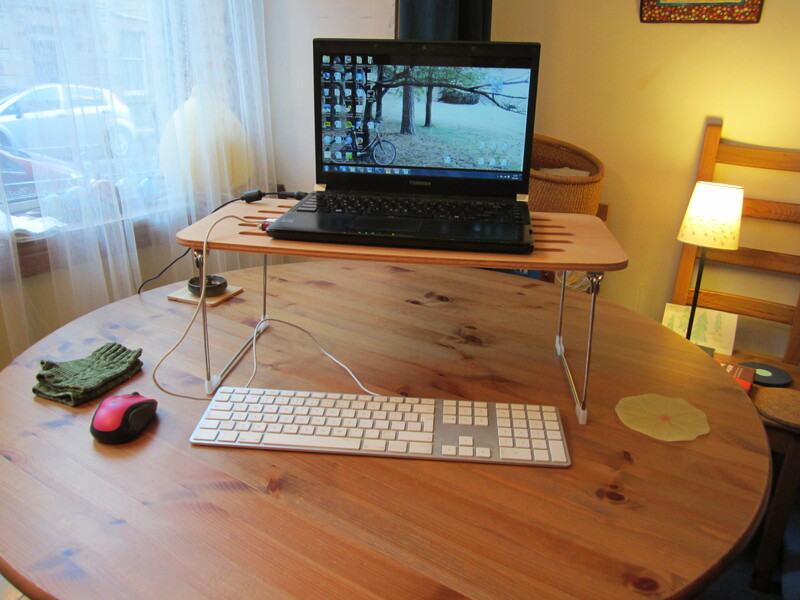 Let sit 30-120 minutes. Strain (or pick spices off the top) and pour into a jar. The straight concentrate looks like rich apple cider and packs quite a punch. It will keep in the fridge for at least a month. Heat milk and concentrate in saucepan over medium heat, swirling pot occcasionally, until thick steam rises from the top. Pour into cup from about 8 inches up to create foam. I hear it’s also very tasty with coconut milk. Haven’t tried it yet, though. For a less rich beverage, try one part each coconut milk, water and concentrate. Add dash of concentrate to club soda or ginger ale. Thank you to everyone for the sweet birthday wishes. It’s a great balm to know that I’m only gone for a bit, not forgotten. 1. The award for best paper title this week goes to: Northern Iroquoian dating strategies. Context indicates that it has to do with the ages of North American languages, but that didn’t stop me from entertaining a brief vision of a pick-up guide for 18th-century Native Americans, written in the manner of an academic paper. All paper titles should be so interesting. 2. My axe came! I had been holding off on my hobby of wood carving until I figured out where to get wood. Lo! and behold, right around my birthday, the winds that have been plaguing us brought down a lovely hardwood, right over the path. Someone took a chainsaw to it to get it out of the way, but all the large branches were just lying there, waiting for me. 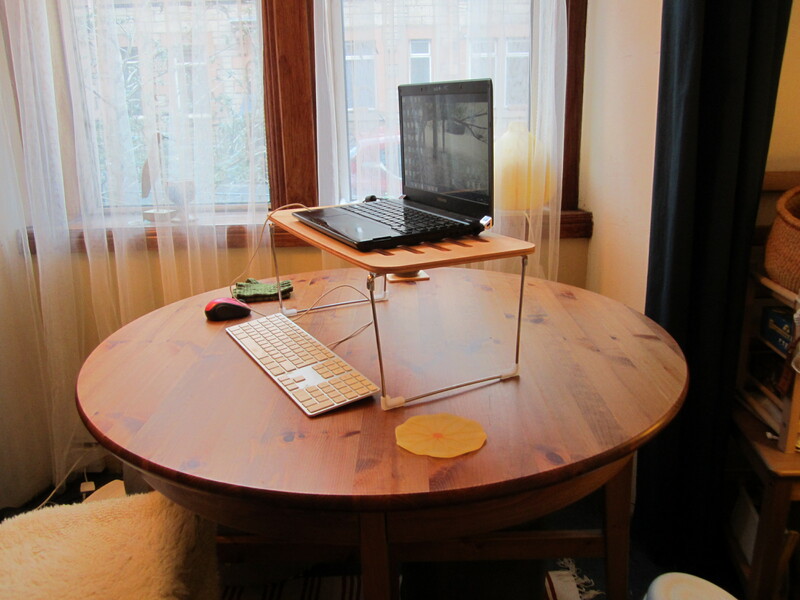 I’m now working out a plan of storage that doesn’t involve the kitchen. The hatchet should help. 3. 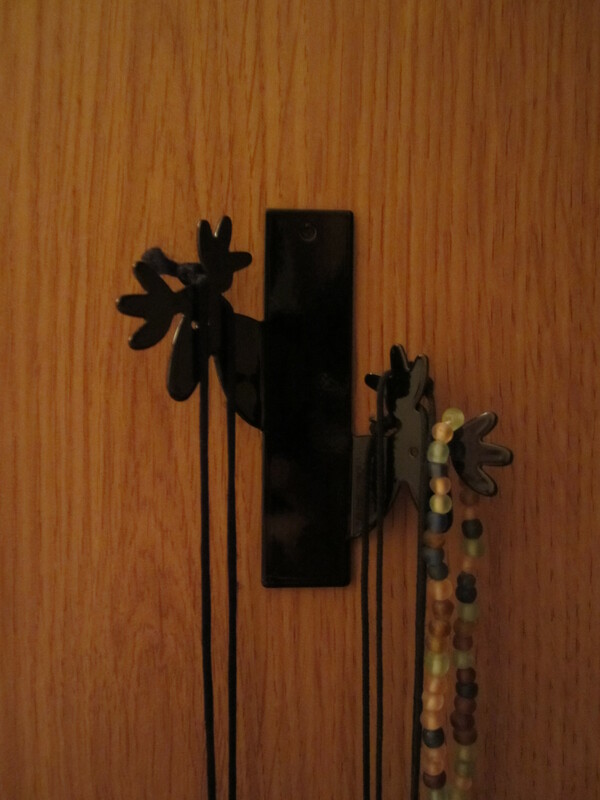 Moose hanger. Moose are inherently funny and dignified. And they make me smile whenever I put on or take off a necklace, which is worth a lot more than I paid. 4. 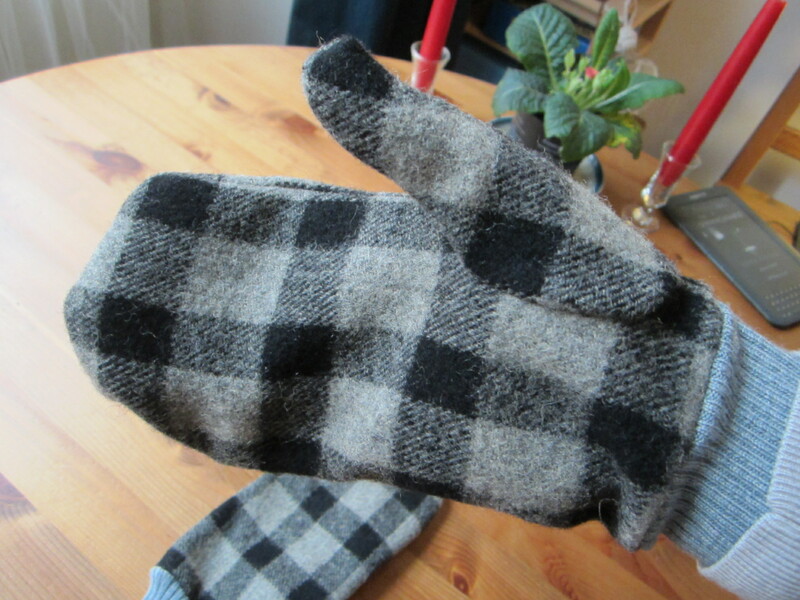 Woolen mittens. Aren’t they beautiful? 6. 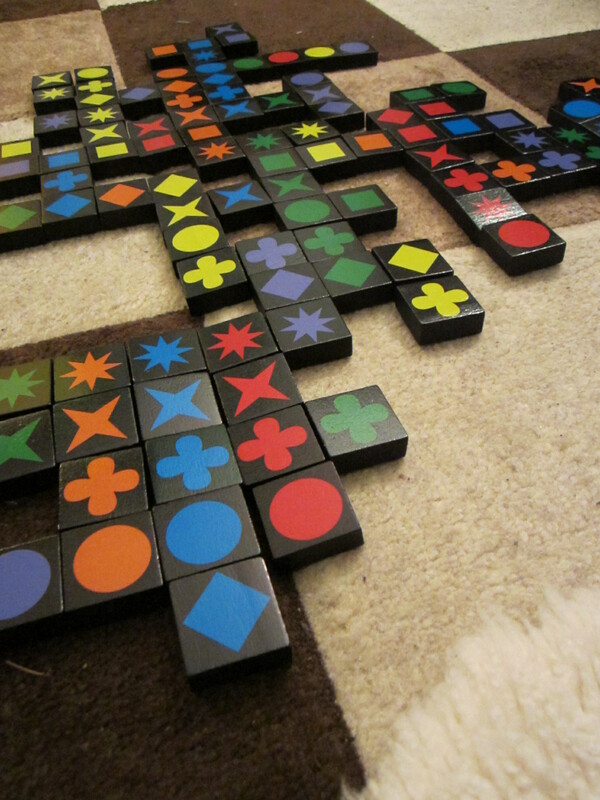 Qwirkle. Like scrabble, but without all the inconvenient words. My husband knows me so well. Space for the New, or Can We Bake It? We miscalculated slightly this year and ended up with a 6-foot Christmas tree in our tiny, tiny living room. For scale, I finally calculated the square footage in our flat: 341. This includes tiny entry and hallway, tiny bathroom (I sidle past the sink sideways, and that isn’t even unusual in this city), and tiny shower room (don’t mistake the “bathroom” for a room with a bath). 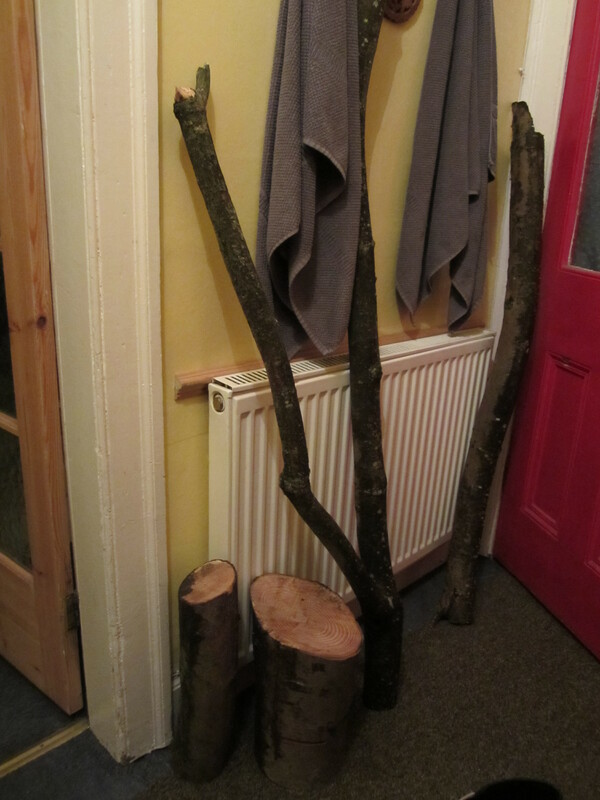 Or to put it briefly: The tree looked a lot smaller outside. During Christmas proper, anticipation covered our hastily re-arranged living room in a rosy haze of anticipation. By the time Hogmanay rolled around, though, excitement had given way to resentment. 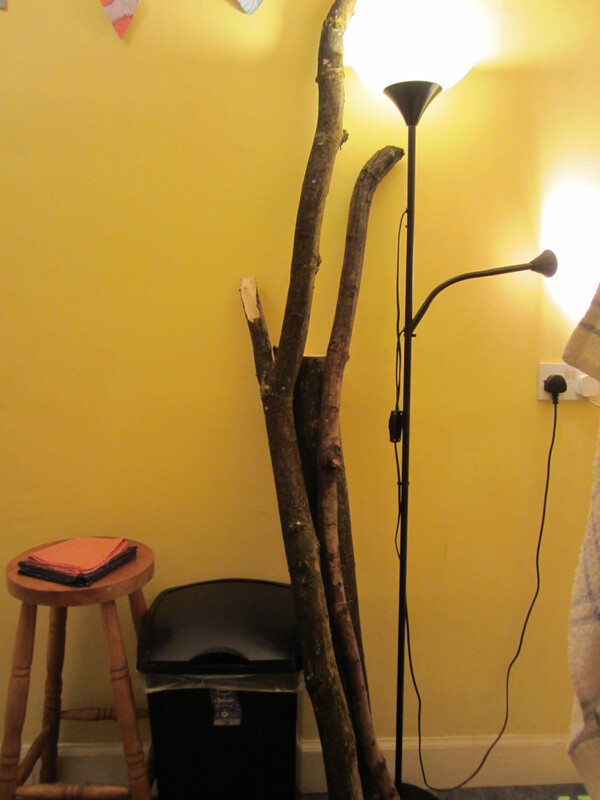 Twelfth night or no twelfth night, the tree had to go. Now that I have my living room back, things feel a lot more peaceful around here. I have a much greater appreciation for the spaciousness of my living room, now that the furniture is where it belongs. I can settle down to my grading with a serene heart. I’m certain it will last until at least the third exam paper. And now, a page from Captain Brid’s galley book, where the rule of thumb is “cook at 350F”. 1. Heat oven to 350F / 180C. 2. Peel sweet potato and cut into 1/2 inch cubes. Place cubes in a steamer insert (I like and use this one) or small non-metal colander inside a larger bowl. Add 1/2 inch water to larger bowl. Cover and microwave on high for 13 minutes. Use an oven mitt when uncovering to avoid steam burns. 3. Meanwhile, chop mushrooms. Fry in olive oil on medium-low heat for about 8 minutes. Season with salt and pepper. 4. Drain and rinse black beans and add to frying pan once mushrooms are done, just for a few minutes to give the beans a little heat. Chop spring onions. 5. Mix all vegetables in a baking dish and season with garlic powder, onion powder, basil, and salt. Sprinkle cheese over the top. Bake 8 minutes. Total time 25 minutes. Serves 4 as sole side dish, or 2 as a whole dinner. Chopping and microwaving is the fastest way I know to cook sweet potatoes. You can also “bake” them in the microwave by piercing them, putting them in 1/4″ water, covering and microwaving on high for about 20 minutes. Consider covering things with a plate or a silicone baking pan instead of plastic wrap when microwaving. It’s better for the environment and doesn’t stick to the sides of the bowl or deflate weirdly afterward. 1. Homemade applesauce. I may have mentioned it already (say, here and here), but I just have to tell you: my homemade applesauce is the best applesauce I can remember tasting. Mumsy Dearest, I apologize for all those times when I was younger and wouldn’t eat your (home canned!) applesauce because it had chunks in it. I now realize that I was missing out. My “secret” recipe is to slice apples into eighths with the skins on, as many as the crock pot will hold, which amounts to about 3 pounds. 1 tablespoon of lime juice over the top, cook on low for 4 hours, puree with an immersion blender until it reaches a consistency I like, add boatloads of cinnamon and just a smidge of nutmeg. No added water or sugar. I used a kilo of local gala apples and 2 leftover cox apples for this last batch, and it’s the best yet. Protip: Use a non-metal spoon to stir in the cinnamon, stainless ones leave weird marks on the crock pot (ask me how I know). It’s always so yummy when I eat that first bowlful from the crock pot that I now pop my applesauce in the microwave for a minute or so before eating to get that warm-apple-pie taste. Better than cookies. Up there with coffee. 2. Endnote bibliography software. I went to a workshop yesterday on the research databases and affiliate libraries available to us at the university, which wound up with a seminar on using Endnote (both free and licensed versions) and Mendeley (free) to manage bibliographies. You enter your references into the software, then any time you want to reference something, pull up the toolbar and select the work you want to reference. And then the bibliography magically appears at the end of your document, neatly alphabetized and in any format you choose. 3. This week I am officially a grown-up. Yesterday I received my first batch of essays to mark, and my application for a staff card. Among other things, this magical card will let me remove otherwise unlendable materials from the library. Mwahahahaha. And today is the day I deal with some stock options from the company I used to work for. Stock options. Way too grown-up for me. 4. Thick sheepskin insoles for winter boots. The thicker, the better. 5.Candied peel. Currently my favourite sweet. Someone made a delicious boatload for our last SCA event, and despite our concerted efforts, we did not manage to finish it off in one sitting. So it’s in my fridge, being delicious one sliver of peel at a time. Tea time is always at four in the afternoon. 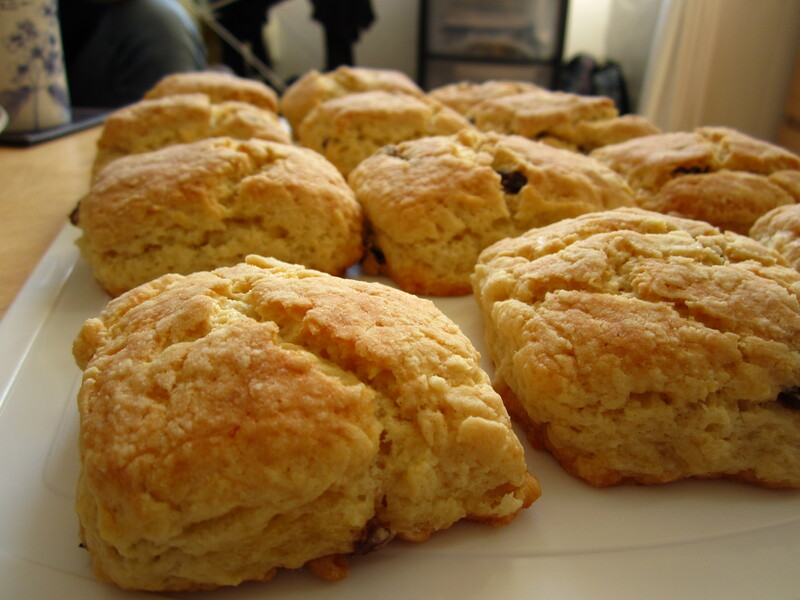 And when one’s companion in tea is providing the scones with clotted cream and jam… well, then one needs to provide ballast, so as not to roll away from the party. My will power doesn’t extend to ignoring scones with clotted cream while at a tea party. Probably because I don’t really want it to. There’s no point in spoiling a good tea party with ill-timed abstinence. She makes really good scones. On the other hand, adding cake or cookies on top of the scones seems unnecessary. 1. Cut cucumber in half lengthwise. Use a melon baller, measuring spoon or teaspoon to scoop the seeds out of the middle and discard/eat them. The cucumber should resemble two dugout canoes. 3. Finely dice the onion. Mix onion, salmon, yoghurt, lemon juice and spices to taste. 4. 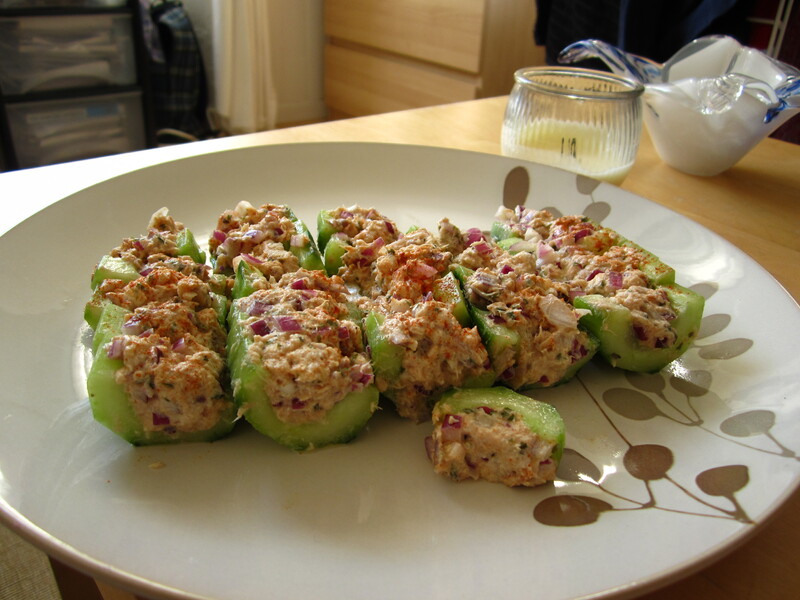 Fill cucumber canoes with salmon mixture. Sprinkle with paprika. Cut into 3/4″ slices and serve. I used salmon because apparently I stopped eating tuna several months ago, when I decided I didn’t like it enough to buy mayo only for that purpose. I hadn’t yet thought of using yoghurt. I had completely forgotten this decision, but happily I did decide, around the same time, to try tinned salmon. Then I promptly forgot about the fish. So there you have it: tiny cucumber crescents fit for a tea party. Or perhaps for lunch. 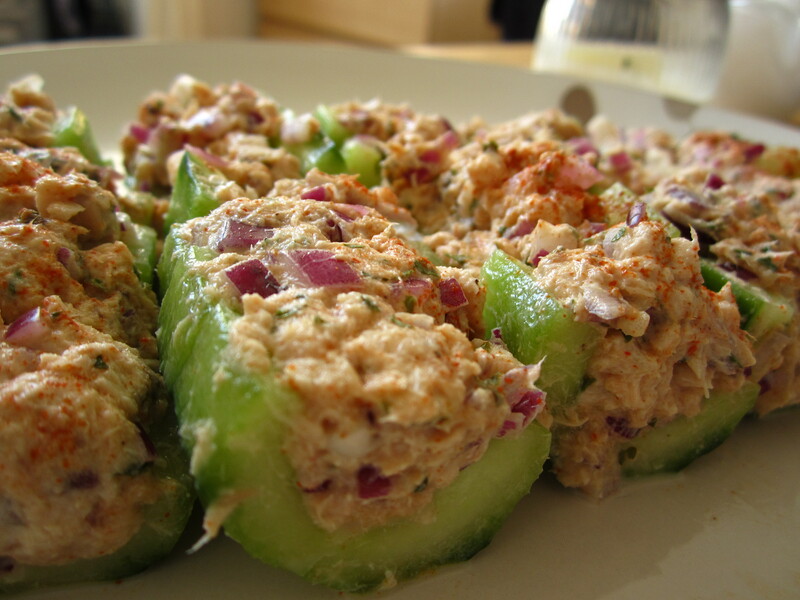 Finger-food-friendly, and much faster than making and filling individual cucumber cups. I’ve tried this with tuna, too, and it tastes just as good, if slightly more like tuna.